The seasons are important in Tokyo, and things often change for the season. The types of clothes on sale, food at restaurants, and even the type of chocolate milk available. Just a few days before Christmas we can see that the season is already changing. 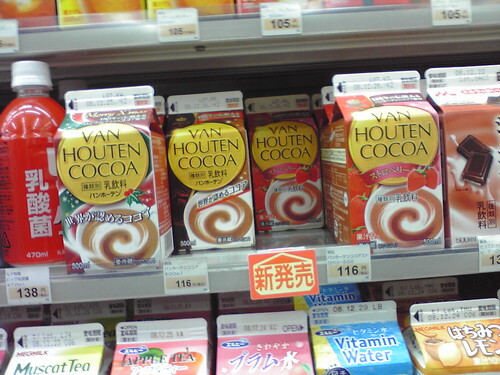 Van Houten Cocoa, a chocolate milk, is changing from its ‘Christmas’ branded packaging back to the normal variety. And a new line of Strawberry cocoa milk is available. It is interesting to observe how often advertising and packaging here in Tokyo changes. This brand, for instance, has changed its packaging 3 or 4 times since we got here in April. There seems to be a need to keep changing, and offering something new, to stay competitive here. This entry was posted in Photos, Travel and tagged chocolate milk, combini, Japan, Tokyo. Bookmark the permalink.